SYNOPSIS: The Great Depression hits home for nine-year-old Kit Kittredge when her dad loses his business and leaves to find work. Oscar nominee* Abigail Breslin stars as Kit, leading a splendid cast in the first-ever American Girl theatrical movie. In order to keep their home, Kit and her mother must take in boarders paying houseguests who turn out to be full of fascinating stories. When mothers lockbox containing all their money is stolen, Kits new hobo friend Will is the prime suspect. Kit refuses to believe that Will would steal, and her efforts to sniff out the real news get her and her friends into big trouble. The police say the robbery was an inside job, committed by someone they knew. So if it wasn't Will, then who did it? REVIEW: Kit Kittredge is the first big screen production based in the popular book series American Girl®. The film was directed by Patricia Rozema (Mansfield Park) from a screenplay by Ann Peacock (The Chronicles of Narnia: The Lion, The Witch and The Wardrobe). Released by Picturehouse back on July 2nd, 2008. 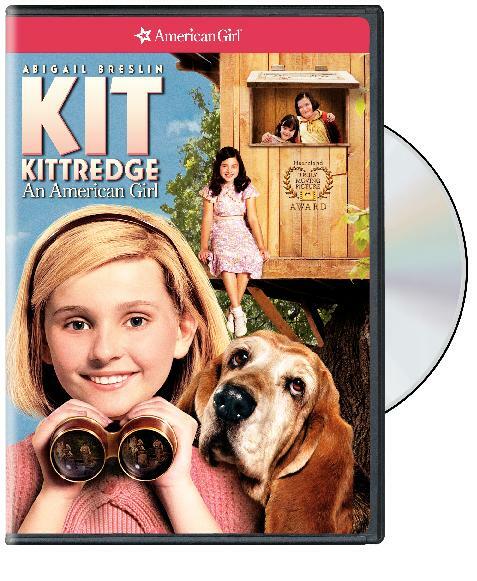 Kit Kittredge managed to collect about $20 million dollars in its theatrical run, able to recover its budget money of about $10 million dollars. However the movie was considered a disappointment by Picturehouse. Warner Bros Home Entertainment will be releasing this beautiful, highly entertaining and underestimated film in DVD October 28,2008. This is one of those film that deserved better luck in its theatrical release. Just like it happened with the second film in the Chronicles of Narnia series, Kit Kittredge was a victim of a bad release date decision by Picturehouse. This is a film that was destined to be released either in November or December. In this slot the film would have had the opportunity to attract moviegoers looking for a good quality family movie. Fortunately, the movie is getting its DVD release before the holidays. The film follows in great depth the main footsteps of the book, "American Girl". Historical facts, interesting characters and story that is hard to find in any other publication. In this particular story, the historical event is during the Great Depression. The screenplay also is well written by Ann Peacock, developing a very entertaining story and at the same presenting the reality of the historical period without losing focus in its target audience, the whole family especially the children. Director Patricia Rozema does a beautiful job recreating the events of the Great Depression. She presents with great wit and sensibility some of the situations faced by the people at the time, bringing to viewers the changes and consequences that people made in order to survive during this historical period. It is by this effort that the film takes the audience back in time to the mid 1920's, therefore Patricia Rozema takes a little long to get to the exciting part of the film, which is when Kit and her friends embark into the investigation of who is behind the robberies in their neighborhood. Overall the young cast delivered a good performance. Madison Davenport who plays Ruthie Smithens, Kit’s best friend and daughter of the local banker and Zach Mills who plays Stirling, a boy who comes to live at Kit’s house as a boarder after his parents lose their house. But is once again Abigail Breslin who delivers another outstanding performance, bringing to life this beloved character who will make kids and grown ups fall in love.